Bristol Bay is the huge bay lying just north of the long arc of the Aleutians. It is an area of incredible natural abundance, both in the marine and terrestrial environments, as recognized with 27 globally-significant Important Bird Areas, two National Parks, four National Wildlife Refuges, two Western Hemisphere Shorebird Reserve Network sites, one Ramsar Wetland of International Importance, one National Monument, and one State Park. The existence of substantial copper, gold, and molybdenum deposits in the uplands of Bristol Bay has been known for decades, and various concepts for mining the deposits have been put forward over the years. For the last ten years or so, several proposals for the huge open-pit “Pebble Mine” have been debated. These would impound large amounts of water, waste rock, and mine tailings behind several earthen dams at the mine site. Experience has shown that the eventual failure of such earthen dams is almost guaranteed, which would release huge plumes of contaminated sedi-ment into several rivers and ultimately Bristol Bay itself. In any given year, millions of birds arrive from around the globe to breed, forage, or rest in Bristol Bay. Perhaps no place else on Earth is so important to so many birds from so many different conti-nents. At the same time, tens of millions of salmon swim through Bristol Bay each year, providing a foun-dation for both the local economy, as well as the staggering number of birds. All five of the Eastern Pacific salmon species spawn in the freshwater rivers flowing into Bristol Bay, which is considered to support the largest salmon run in the world. • Millions of shearwaters (Sooty and Short-tailed) that nest south of the equator arrive in Bristol Bay each summer to forage, while the Southern Hemisphere undergoes its cold season. • The Short-tailed Shearwater is the most abundant of these Southern Hemisphere visitors, num-bering in the tens of millions. • Over a million breeding seabirds, including Tufted Puffin, Common Murres, and Black-legged Kitti-wakes. • At least 75 marine bird species and 24 shorebird species nest in Bristol Bay. • About 15,000 Tundra Swans breed in Bristol Bay’s lowlands. 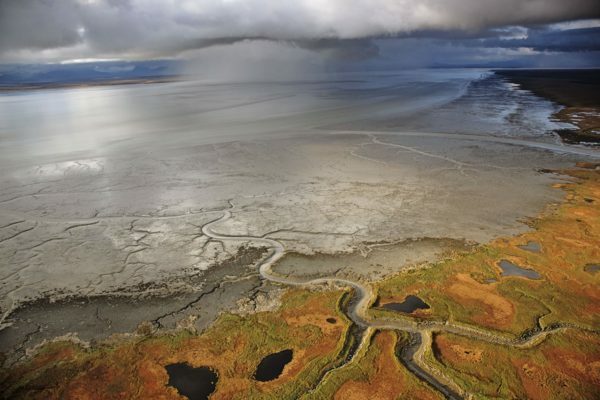 ♦ Millions of shorebirds stage in Bristol Bay’s rich coastal estuaries during the fall and spring, making the region one of the most important shorebird areas in North America. ♦ Nearly the entire global populations of Emperor Goose and Pacific Black Brant use Izembek La-goon in the southern portion of Bristol Bay. ♦ Bristol Bay is a global stronghold for Steller’s Eider, a federally threatened species. ♦ An estimated 75% of the Pacific Black Scoter population spends time in the Bristol Bay region. ♦ About 40% of the western population of King Eiders winters or migrates through Bristol Bay. Take action to conserve this remarkable resource. Visit http://ak.audubon.org/news/open-pit-mining-threatens-bristol-bay and click on the “Take Action: submit a public comment” link to submit a comment to the EPA to protect Bristol Bay and halt all proposals to develop the Pebble Mine. A more recent National Audubon alert, with a letter to the US Army Corps of Engineers, can be seen at: https://tinyurl.com/yb8nkbh9 (this will come with my name auto-filled in, since I received the alert. Simply delete my name and email and fill in your own).